Comments: The Showman 12, Showman 15, and Double Showman all used the same head with the only difference being the size and speakers of the the speaker cabinet. Maroon grilled Double Showmans exist, but are very rare. The harmonic vibrato tremolo circuit left half a dual triode (7025 or 12AX7) unused. The schematic of the 6G14 shows (6) 7025’s and (4) 6L6GC’s. The 6G14A shows 2 12AX7’s, 4 7025’s and (4) 6L6GC’s. The power output of these amps was 85 watts. Well, no. The 6G14 used four 6L6GCs while the 6G14-A used four 5881s. 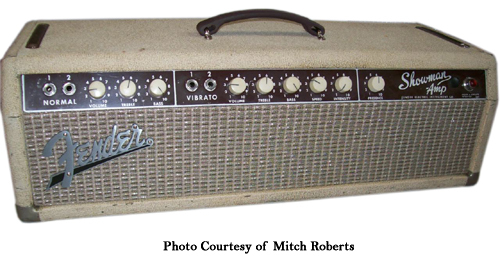 The output of either was reported by Fender to be 85 W.
The 6G14 and 6G14A circuits are entirely different preamp topologies. The 6G14 Showman and 6G8 Twin employed the “James” preamp circuit. The latter circuit with the (A) signifier was the original precursor to the famous AB763 Blackface circuit.